A company’s brand is so much more than its logo—it encompasses every part of the customer experience, from marketing messages to product quality to how staff members answer the telephone to customers’ interactions with employees. Simply put, a brand is a company’s promise to its customers. It tells them what they can expect from a company’s products and services, and it differentiates an organization’s offerings from those of its competitors. The value of a brand is derived from who an organization is, who it wants to be, and how people perceive it. The value of a brand is important to the success of any organization. InfoTrends and Buyers Laboratory, LLC (BLI) recently unveiled a new branding after a long and thorough process of strategic evaluation and analysis. 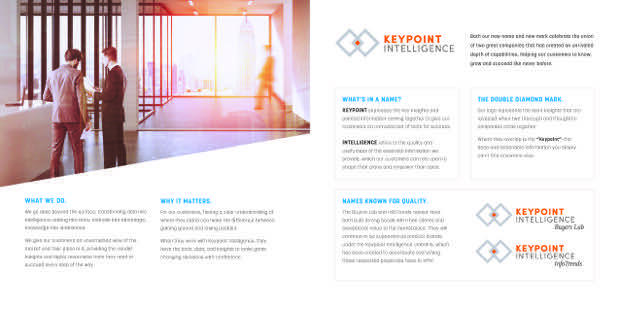 Many of you likely saw the press release announcing our new name, Keypoint Intelligence. 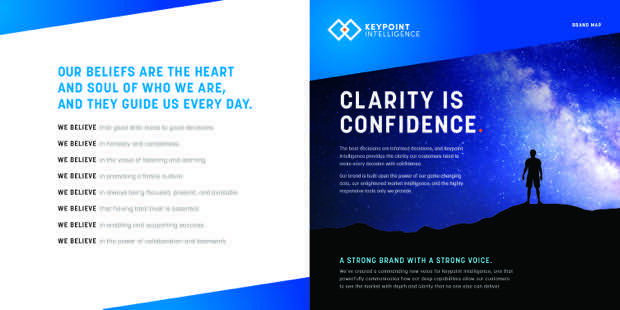 Given the importance of branding to your organization and our recent experience, this article shares the journey that BLI and InfoTrends took to evolve into Keypoint Intelligence. It also outlines the steps that we will be taking to formally establish our combined brand in the market. A year ago, BLI announced its acquisition of InfoTrends. This move was a significant event in the evolution of both companies. The combined business brings together Buyers Lab’s expertise in evaluation and testing with InfoTrends’ leadership in market research, strategic consulting, training, and education. Over the past several months, our combined organizations have been working diligently to evaluate how we should brand ourselves to permeate the appropriate values across our entire organization while also delivering a clear brand promise to our loyal customer base and prospective clients.